The perfect outdoor setting for your Toronto Wedding. UNLIMITED POSSIBILITIES FOR EXTRAORDINARY MEMORIES! 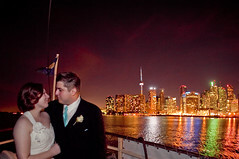 The ultimate venue for Toronto Wedding Cruises–your ship awaits! 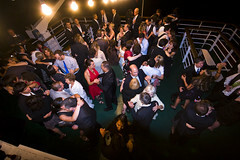 Mariposa Cruises invites you to experience a unique and personalized wedding celebration aboard any of our six love boats. 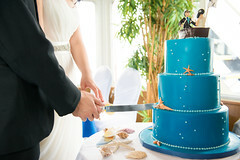 A Mariposa Cruises wedding cruise is unlike any other. Our boats range in size and style to suit all tastes. Each offer the fantastic backdrop of Toronto’s stunning skyline and the harbour’s natural beauty. Our venue provides opportunity for your guests to enjoy your wedding together, with the added pleasure of leaving the city’s hustle and bustle behind, without actually leaving the city. Wedding photos are afforded romantic backdrops and ever changing views. Day or evening, Toronto’s skyline is truly magnificent and captured best from onboard our boats. Pre- wedding gathering? Ceremony? Reception, or both? 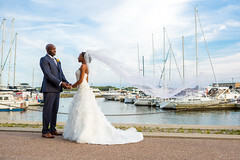 Mariposa Cruises offers wedding cruise packages to accommodate a wedding reception, or a combination of both your ceremony and reception (up to 150 guests). Our friendly representatives are available to assist you in choosing the ideal vessel based on the style of your wedding event and your anticipated number of guests. For a complete overview of our wedding venue spaces, wedding menus, services and inclusions please download our Wedding Package. Want more details or a custom quote? 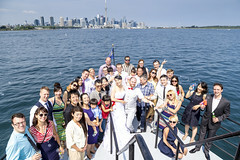 Complete our contact form below or call us at 416-203-0178 for more details about our wedding cruises. There are a number of details to consider when planning your wedding day. Our team of experts are happy to assist with any questions you may have. In the meantime have a look at some of the details below. 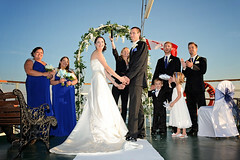 A Showboat Wedding: Wonder what a wedding cruise with Mariposa Cruises would be like? 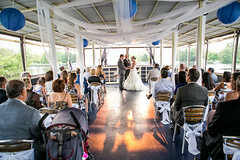 Have a look at this real wedding aboard the Showboat. 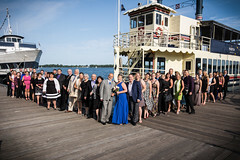 MasterChef Canada -Wedding on the Waves: We welcomed the contestants from MasterChef Canada, Season 2 aboard our Northern Spirit to cater for a very special harbour cruise wedding. Red vs. Blue who will win? 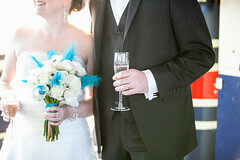 The Wedding Planner: Learn what it would be like hosting your wedding aboard Mariposa Cruises. Live with Rogers Daytime – Wedding Planning Ideas 2014: Our Wedding and Event Coordinator Anna Chowthi chatted with Rogers TV Toronto host Val Cole about weddings with Mariposa Cruises and 2014 wedding trends. Live with Rogers Daytime – Wedding Planning Ideas 2013: Event Manager and Wedding Specialist, Sara Leblanc chats with Rogers Daytime host Val Cole about weddings aboard Mariposa Cruises and Spring 2013 wedding trends. Engagement Photo Packages are available on The Rosemary! Learn more. 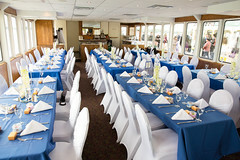 Mariposa Cruises has hosted more weddings than any other operator in Toronto– trust your day with the professionals! But just don’t take our word for it. Read what some of our recent couples had to say. 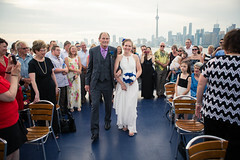 Steve and I got married on the Oriole on July 7 2018. We had the most amazing experience. Staff was great. Everyone of them. It was a beautiful warm day . We had an amazing time with our guests. They also complimented on the scenery and the food was absolutely delicious. Everyone was very helpful from beginning to end. Would definitely recommend to anyone getting married. It was one of the best days of our lives. We don’t have one complaint. Thanks again for making our special day perfect. The DJ was great. He kept everyone rocking. Head on over to our Captain’s Blog and take a look at Sharon and Joe as they reflect on their wedding with Mariposa Cruises ! 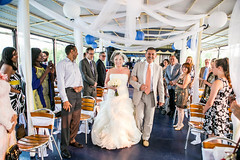 We had our wedding on the Mariposa’s Oriole this July. The experience was amazing from start to finish. First we met with Brenda Tucker to go over the details of what we wanted and reserve our date. She was very helpful and quick to answer any questions we had. From there we were assigned a event coordinator – Lauren Matunin. I was very impressed with Lauren’s attention to detail in handling all our requests. The evening boat cruise was amazing. Dinner was delicious, DJ service was excellent and everyone had a great time. The cruise manager Alisa ensured that everything went smoothly and we didn’t have to worry about a thing. All staff we dealt with provided exceptional customer service. We couldn’t be happier with Mariposa. They are true professionals that offer a unique wedding venue at a great value. Thank you! Elena & Alex M., July 2017.